128 Marlborough is located on the south side of Marlborough, between Clarendon and Dartmouth, with 126 Marlborough to the east and 130 Marlborough to the west. 128 Marlborough was built ca. 1868 for Charles William Freeland for speculative sale, one of eleven contiguous houses (110-130 Marlborough) built on a parcel 198 feet wide which he purchased from the Commonwealth of Massachusetts on October 26, 1868. Click here for an index to the deeds for 128 Marlborough. On April 6, 1869, 128 Marlborough was purchased from Charles Freeland by Susan Haskell (Keep) Page, wife of Dr. Calvin Gates Page, a physician. They previously had lived at 69 Myrtle, He died four weeks later, in May of 1869. 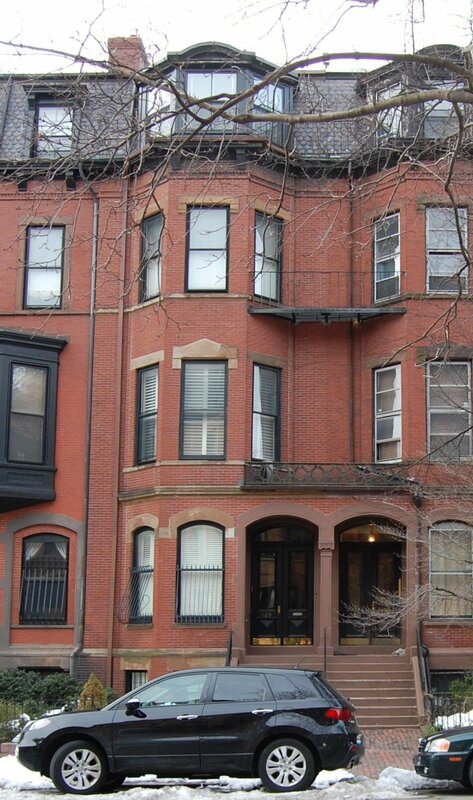 Susan Page continued to live at 128 Marlborough with their three surviving children: Edith Page, Hollis Bowman Page, and Calvin Gates Page, Jr.
Also living at 128 Marlborough from 1870 until 1875 was stockbroker Charles Danielson Lincoln. By 1876, he had moved to College Hill. Hollis Page married in December of 1887 to Nina Cutter. After their marriage, they traveled to Munich and by 1890 were living in Watertown. He was an artist, instructor in mechanical drawing, and expert on color harmony. Susan Page continued to live at 128 Marlborough during the 1888-1889 winter season, but moved thereafter to Newton. Edith and Calvin Page moved with her. She continued to own 128 Marlborough and lease it to others. During the 1889-1890 winter season, it was the home of wholesale dry goods merchant Samuel Bradford Dana and his wife, Katherine Wallen (Lyon) Dana. They previously had lived at 145 Beacon. By the 1890-1891 season, they had moved to 223 Beacon. During the 1890-1891 winter season, 128 Marlborough was the home of Thomas Nelson and his wife, Annie (Bigelow) Nelson. They had lived at 251 Commonwealth during the previous season. A former real estate dealer, he was treasurer of several mining companies. Annie Nelson died in March of 1891 and by 1892, Thomas Nelson had moved to a new home he had built at 508 Beacon. During the 1891-1892 winter season, 128 Marlborough was the home of Mrs. George McClure, probably Sarah J. (Craige) McClure, the widow of George McClure, a cabinetmaker, who died in January of 1891. By the 1892-1893 season, she had moved to The Ludlow (southwest corner of Clarendon and St. James). By the 1892-1893 season, 128 Marlborough was the home of Miss Sarah Borden Durfee Lewis. She was a teacher and operated a private school in the house. During the 1893-1894 winter season, Dr. Charles Allen Porter, a surgeon, also was living there, but he had moved to 24 Marlborough by 1895. 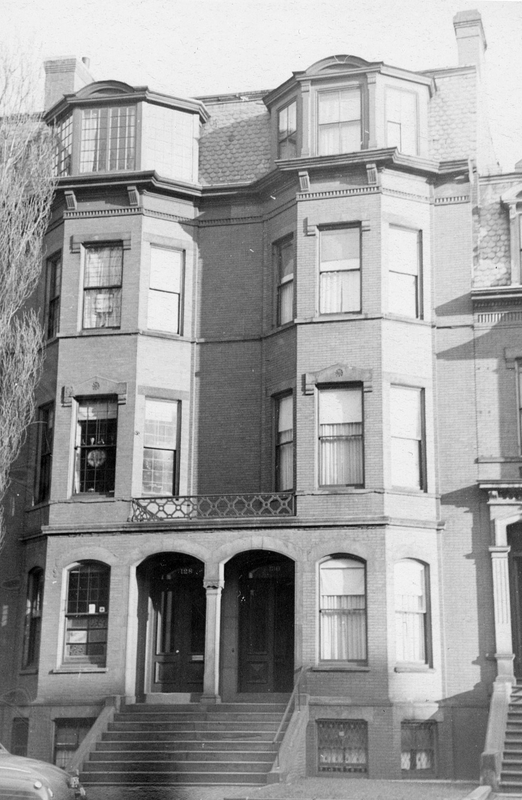 Miss Lewis continued to live at 128 Marlborough during the 1895-1896 winter season, but moved thereafter and by 1900 was living in Cambridge. Susan Page died in May of 1895 in Brookwood, Surrey, England and 128 Marlborough was inherited by her three children. By the 1896-1897 winter season, 128 Marlborough was the home of her son, Dr. Calvin Gates Page, Jr., and his wife, Marie Louise (Danforth) Page. They had married in June of 1896 and 128 Marlborough probably was their first home together. Dr. Page was a physician and professor of microbiology at Harvard Medical School. He maintained his medical office at 128 Marlborough. Marie Danforth Page was a portrait artist; she maintained her studio at the house. On December 8, 1897, Calvin Page acquired his brother Hollis’s interest in 128 Marlborough, and on November 7, 1898, he acquired his sister Edith’s interest. Marie Page died in March of 1940. Calvin Page continued to live at 128 Marlborough. He remarried in 1945 to Dr. Rose Carleton Munro, a pediatrician. They lived at 128 Marlborough until about 1948. On November 15, 1948, 128 Marlborough was purchased from Calvin Page by Benjamin George Brooker, a certified public accountant and real estate dealer, and four days later, it was purchased from him by Octavia Morley (Sawyer) Walsh, the wife of Edward M. Walsh, a heating contractor. They previously had lived in Brookline. They had moved to 130 Marlborough by 1950. On September 15, 1949, 128 Marlborough was purchased from Octavia Walsh by Grant Gordon Dwyer and his wife, Betty-Jane (Maynard) Dwyer. They previously had lived in an apartment at 6 Marlborough. He was a purchasing agent with John Hancock Insurance; she was an artist. They had moved to Cohasset by 1951 but continued to own 128 Marlborough and lease it to others. By 1951, 128 Marlborough was the home of Giles Melville Stuart Tod and his wife, Miriam Denise (Cobb) Tod. They previously had lived at 135 Newbury. They had moved to Hingham by 1952. On March 12, 1951, 128 Marlborough was acquired from Grant and Betty-Jane Dwyer by Mrs. Barbara Abbie (McLeod) Graham, the former wife of William Lloyd Graham, who operated it as a lodging house. In the late 1940s, she had been executive housekeeper at the Copley Plaza Hotel. She continued to live at 128 Marlborough (and operate it as a lodging house) in 1961. On May 26, 1961, 128 Marlborough was acquired from Barbara Graham by Charles David Libby, who operated it as a lodging house. He previously had lived at 4 Walnut. He was a sales engineer and later a public school teacher. In July of 1990, he applied to legalize the occupancy of the property as six apartments, noting that there was no record of the legal occupancy. He abandoned the application after a review by the rent equity board. He continued to live at 128 Marlborough in the 1980s and probably until his death in December of 1994. On September 27, 2002, 128 Marlborough was purchased from Charles Libby’s estate by the John 128 Marlborough Street LLC (David Pogorelc, manager of record). That same month, David Pogorelc filed for (and subsequently received) permission to legalize the property’s occupancy as six units. 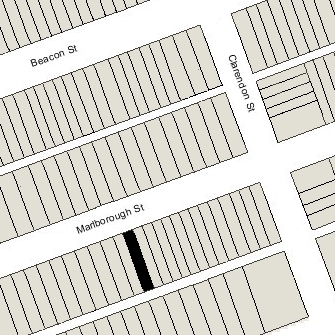 On March 6, 2003, the 128 Marlborough Street LLC purchased the property from the John 128 Marlborough Street LLC. 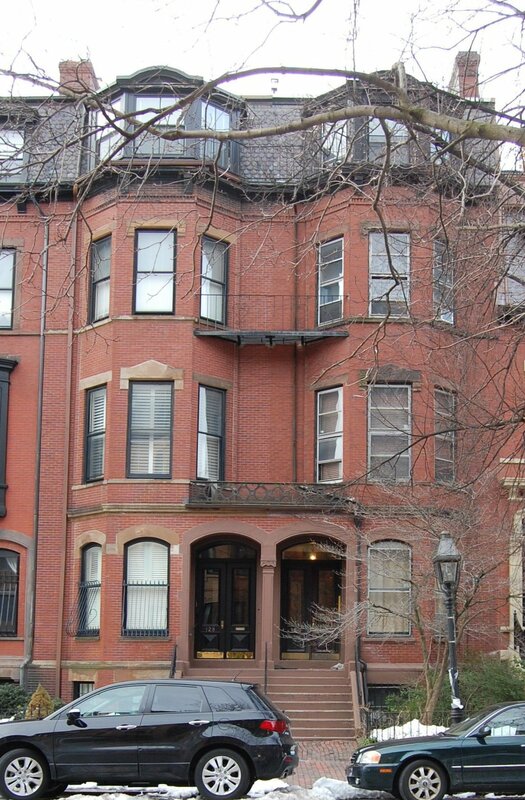 On August 12, 2003, it converted the property into six condominium units, the 128 Marlborough Street Condominium.